“All humans, everywhere in the world and throughout history, have looked up at the sky and wondered at it. This experience is now denied to most people, because of the background light in towns and cities. It is important to ensure that there will be somewhere in England where young people can fully enjoy a cosmic panorama.” – Martin Rees, the British Astronomer Royal, at the opening of the Northumberland Dark Sky Park in 2013. Light pollution is the unnecessary and excessive use of light at night. It includes such things as over-illuminating the outside of buildings with bright floodlights, excessive use of bright security lights, lights on in offices at night long after all the occupants have left, brightly lit shop windows still blazing when there are no passers-by doing window shopping, and the use of bright streetlights on quiet rural roads where there is little need for this from a health and safety point of view. All these things contribute to skyglow, when all the light from the various sources passes upwards into the sky, interacting with dust particles and air molecules and is scattered in all directions. The sky is never properly dark, denying all of us the experience of truly seeing the night sky. An observer at ground level (A) sees a dull glow in the sky due to this scattered light. 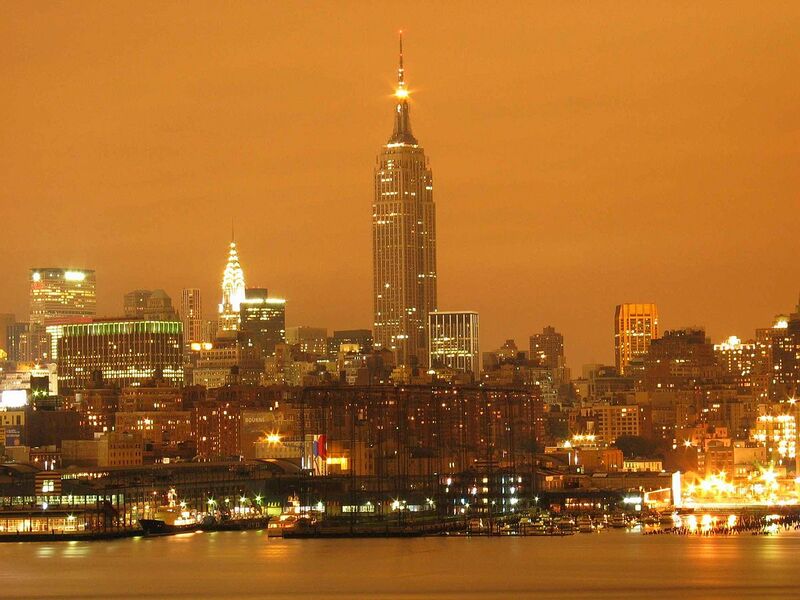 The image below is a long exposure photograph of New York City and the orange colour of the sky is due to skyglow. There is a small natural component to skyglow, caused by effects such as scattered starlight, scattered moonlight and also some dust in plane of the planets, known as zodiacal light. However all these effects added together only give rise to a small fraction of the total skyglow over cities. The vast majority of skyglow comes from human activity. 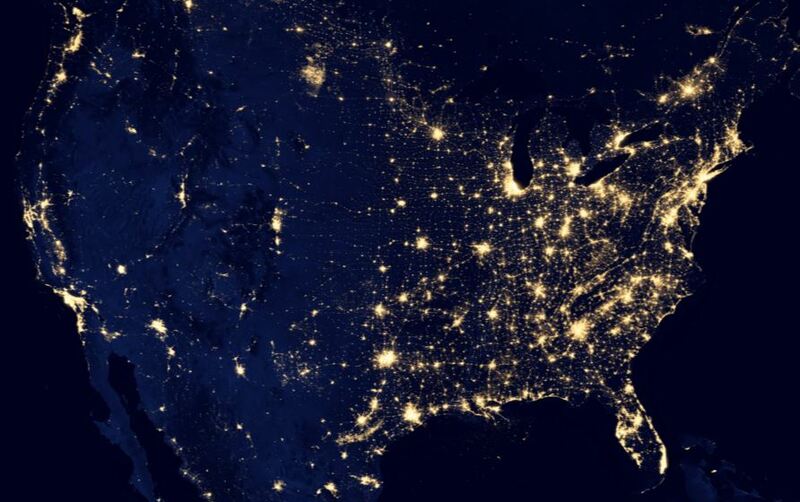 This image was produced by NASA from a number of night time images and shows the extent to which the US is lit up at night. One of the effects of skyglow is that it greatly reduces the number of stars which can been seen on a clear night. On a perfectly clear moonless night well away from light pollution, it is possible for someone with good eyesight to see up to 4,500 stars (King 2014). However, in the centre of a large city such as New York or London, it will only be possible to see around 50 stars – the very brightest ones. The night sky is just too bright to allow fainter stars to stand out and it is impossible to make out the constellations. Even in smaller towns and villages there is still some skyglow from the brightly lit roads and buildings. The result of this is that the vast majority of people – probably at least 95% of the population in densely populated countries like the UK – live in a place where they will never have the chance to see the beauty of the Milky Way, the dim band of light arching across the night sky, whose individual stars cannot be distinguished by the naked eye. In 1988 International Dark-Sky Association, or IDA, (www.darksky.org) was set up in an attempt to remedy this situation. It is active in a number of areas, including the education of communities and public officials about light pollution and the suggestion of practical solutions which balance the human need for lighting against the human desire to see what exists beyond our lives on the Earth. For example, it both promotes and gives a seal of approval to outdoor lighting fixtures that minimise glare and provide light only where it is needed. 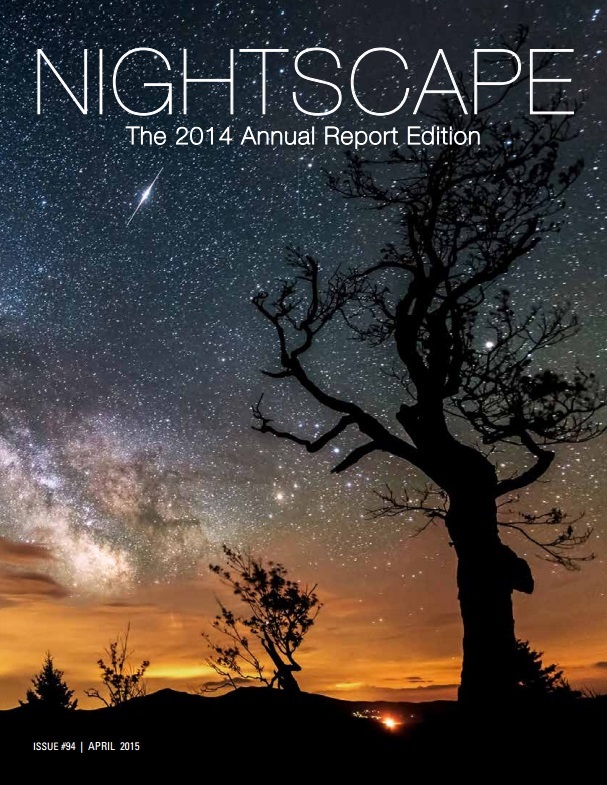 If you are interested in the organisation’s fight against light pollution, you might be interested to download its free magazine called Nightscape (http://darksky.org/resources/ida-publications/nightscape/). Another very important activity of the IDA is its certification of dark sky parks and reserves in fairly remote places, where the public can see the stars free of light pollution. The Northumberland Dark Sky Park is a 1,500 square kilometre area in one of the remotest parts of England, near the border with Scotland. The area is mostly unpopulated (a mere 2,200 people live in the area)and is home to Kielder Forest, the largest man-made woodland in England, and Kielder Water the largest artificial lake by volume in the whole of the UK (just in case you’re interested, Rutland Water has a larger surface area, but a smaller volume). The park is has some of the darkest skies in Europe and any property or land developers who wish to be active in the area are only given permission to do so if they follow strict regulations limiting the use of lighting. At the centre of the park, in an area which is completely uninhabited, is the Kielder Observatory (http://www.kielderobservatory.org/) which houses a collection of small telescopes including two reflecting telescopes with mirrors 16 inches and 20 inches in diameter for use by the public in oureach events. Mrs Geek and I attended such an event a couple of weeks ago on October 10. I had chosen this date very carefully in advance for two reasons. Firstly, on that date there would be no Moon visible at night, so the sky would be as dark as possible and we would be able to clearly see the Milky Way. Secondly, on this date it gets dark early, with sunset was just after 6 pm, but temperatures are much milder than in Winter (Mr Geek doesn’t iike to get cold!). We stayed in the small village of Kielder near the observatory and set off for our evening of observing at 7:30 pm. It was interesting to see how incredibly dark it was compared to Manchester as we drove from our bed and breakfast accommodation through the tiny village. The main road was unlit and the few residential side streets were barely illuminated up by a small number of dim streetlights. I doubt if the light levels in these side streets were more than 1% of what they are in our street in Manchester, which is brightly lit by the bright yellow sodium lamps which are common in the UK. We left the village on the unlit road, and then turned off to drive for miles on a narrow track through dense pitch black forest. When we arrived at the observatory we were guided to the entrance by volunteers with torches. I’m very sad to say that this story does not have a happy ending. We didn’t see a thing. We were at the observatory for three hours and he sky remained covered in thick clouds all this time and there was not a single star to be seen. We had chosen the wrong weekend. So, you don’t just need a lack of light pollution – you also need clear skies, and the northern half of the UK is not renowned for its glorious weather. This is why professional astronomical observatories are situated on high mountains, to get well above the clouds! 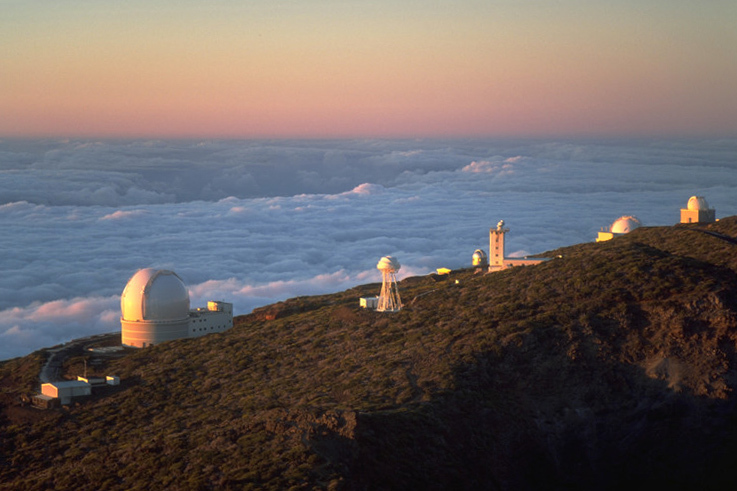 In my student days as a PhD researcher, I was lucky enough to use the Isaac Newton telescope in an observatory on a mountain in La Palma in the Canary Islands. Some telescopes at the Roque de los Muchachos Observatory on La Palma in the Canary Island. This observatory at 2,400 m (nearly 8,000 feet) above sea level is above the clouds. This post has so far focussed only on the impact of light pollution on the human occupants of our planet. However, it also has a negative effect on the behavour of noctural animals. For example, glare from artificial lights can confuse amphibians such as frogs and toads in their wetland habitats. Their nighttime croaking is part of the breeding ritual, and if artificial light means that they do not think it is nighttime, they may fail to perform the necessary courtship rituals to attract a mate, interfering with reproduction and leading to a reduction in populations. You can read more about this here: http://darksky.org/light-pollution/wildlife/. I live in So. Cal. now, for almost 40 years. I was raised in a small logging town in central Idaho. I went up last year, still have relatives who have property way up the mountain where there is no light contamination. I had forgotten just how many stars are in our skies. I had even forgotten how apparent the milky way is and why it is called that. Wonderful! Exactly. The Milky Way is, to me, the most astonishing sight in the night sky – we’re seeing our own galaxy, edge-on, from the “outer rim territories.” Having moved from the Cascade Mountains to Washington, D.C., I haven’t seen the Milky Way in years. Mankind has been isolated from the reality of the beautiful, bountiful and benevolent universe that made and still sustains every atom and life in the world today. That physical reality, according to Max Planck’s 1944 lecture in Florence, Italy, would not exist, but for the “conscious and intelligent Mind” that guides the force holding the spinning sub-atomic particles – (e-, p+) pairs – together as atoms. A very good point, well made! I was raised and still live in northern New Jersey, about 40 miles outside of New York City. I live in probably the area with the highest light pollution in the world. Although I had always had an interest in Astronomy and knew about the Milky Way and the constellations, I didn’t have a chance to see the stars fully until ten years ago. It was a moment I’ll never forget. A friend and I were camping in the middle of the country, far away from cities. We met a person from another rural state and we all decided to wake up in the middle of the night to see the Milky Way. When the time came, I unzipped my tent and looked up, speechless. Our friend from the area was bemused, he had seen this sight every night his whole life. He was shocked that I had never once seen the Milky Way. It was like meeting a person who had never seen the moon, he said. If course I had seen pictures and documentaries, but seeing it in person…. the seeming endless stars overhead and that beautiful ribbon of diffuse light… there were tears streaming down my face. I suddenly felt like I had been cheated my entire life. When I returned home, I asked other people if they had ever seen the Milky Way in the sky. Most people who lived in the area their whole lives didn’t even realize it was something one could see in the sky. I think of all of the millions of kids here that have been denied of our heritage, and wonder how we can ever inspire a new generation of astronomers and cosmologists if the very thing that has inspired mankind to reach for the stars is simply absent from their experience, as it was mine. You are very welcome and I thank you for raising our public consciousness on the issue of light pollution. Here’s to hoping more areas of the developed world realize the importance of preserving our night sky so future generations can look up, wonder, and be inspired. I’m fortunate to live in the middle of the continental USA in Nebraska. Each summer around the New Moon is the Nebraska Star Party held near the town of Valentine. Amateur and professional astronomers and lovers of starry skies gather for this annual event. I’ve attended two of these events and had a wonderful, dark time at both. You are very fortunate to live in an area with such clear skies. Even in the relatively rural area where I live now, the galaxy is nowhere near as clear as what I remember seeing as a child. At sea is a good place to view it. Electric lights, like automobiles, were seen as miraculous blessings at first–how strange that both, with time and profusion, revealed themselves to be destroyers of the planet. Like antibiotics creating resistant bacteria, or computers creating social disconnection, or powered flight leading to the Dresden firestorm. Progress is a paradoxical concept. Very true. Not being able to see the stars at night leads to a disconnection with nature. Of all the things I truly missed when I first moved from the country to a big city, not seeing my familiar stars at night was the most painful. I felt like I’d lost my internal compass. Moving from the southern hemisphere to the northern one was disconcerting for the same reason. Very true. There is something quite magical about seeing thousands of stars in a truly dark sky. This past summer we travelled around some National Parks and witnessed true dark skies. It was an experienced that was we hope never to forget. So sad that so many will never witness this. The milky way was just unbelievable. It was an experience not to be forgotten anytime soon. What was the most impressive was that we just sat in a chair and looked straight ahead without having to look up and you could see it. It would be wonderful if everyone could have the opportunity to experience it with all it’s wonderment. A very well-explained article. I’m going to add star-gazing to the list of things I want to do. And it’s true, light pollution means we miss space events that will happen only once in our lifetime. Northumberland is a shining (not) example to the rest of Britain. Sadly, here in rural Normandy in France they don’t seem to have cottoned on to dealing with light pollution. Thank you for sharing this. I am amazed at how many people fear the dark; we long for it and can’t find it. Great post!